Illustration of sickled blood cells and the ZFN ‘cutting’ process. UCLA stem cell researchers have shown that a novel stem cell gene therapy method could lead to a one-time, lasting treatment for sickle cell disease — the nation’s most common inherited blood disorder. Published March 2 in the journal Blood, the study led by Dr. Donald Kohn of the UCLA Eli and Edythe Broad Center for Regenerative Medicine and Stem Cell Research outlines a method that corrects the mutated gene that causes sickle cell disease and shows, for the first time, that the gene correction method leads to the production of normal red blood cells. 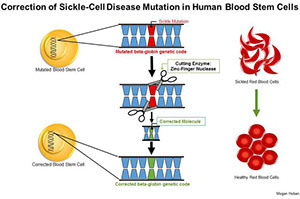 People with sickle cell disease are born with a mutation in their beta-globin gene that causes blood stem cells — which are made in the bone marrow — to produce rigid red blood cells that resemble a crescent or ‘sickle’ shape. These abnormally shaped red blood cells do not move smoothly through blood vessels, resulting in insufficient oxygen to vital organs. The stem cell gene therapy method described in the study seeks to correct the mutation in the beta-globin gene so bone marrow stem cells produce normal, circular-shaped blood cells. The technique used specially engineered enzymes, called zinc-finger nucleases, to eliminate the mutated genetic code and replace it with a corrected version that repairs the beta-globin mutation. The research showed that the method holds the potential to permanently treat the disease if a higher level of correction is achieved.